In the distance, I could hear the pounding of a drum and the hoots and hollers of people in the night. As I drew closer, I could see people dressed in animal skins dancing around a fire. Behind them stood a teepee. Occasionally the sparks from the fire would drift up past the teepee, blending into the starry sky. Past the dancing and teepee there was a different rhythm being played. As I walked closer, I could see the outline of a big canvas tent. Lights were strung inside the tent, silhouetting those standing around outside. 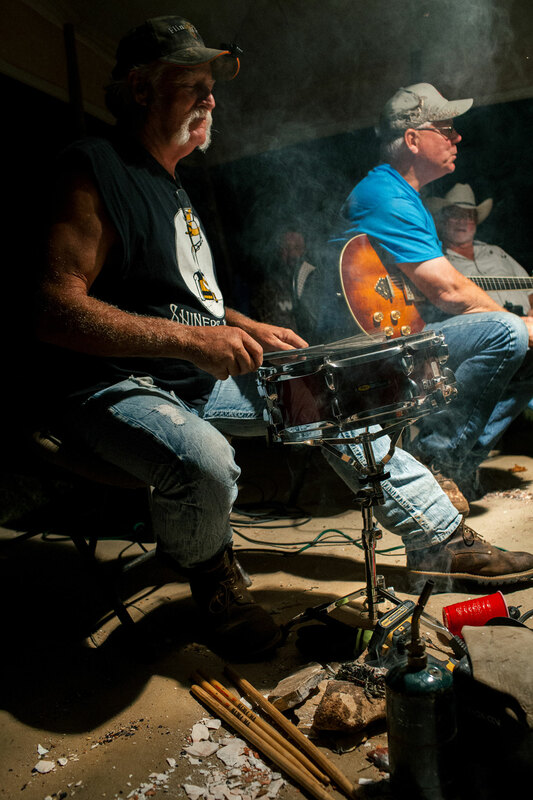 In the tent, a circle of musicians sat in chairs: a few guitar players and a drummer. The sound of smooth blues danced with the cigarette and sage smoke. Beneath the feet of the musicians were piles of flint and obsidian from grueling hours spent knapping arrow heads. It is late September. I am northwest of Springfield, Missouri, down long winding backroads, at the Hulston Mill. This is the Bois D’Arc Skills Camp & Knap-In. I had arrived with little cash expecting to be able to get a meal onsite. Had I thought about it, I would have remembered this was an encampment in the woods. There is no fast food in the woods. What I didn’t know was I didn’t need to pay for food because food was all around me. I just had to look for it. Lunch time had rolled around and I was hungry. Just as I was going to find some food, a group of students next to me began to carve out a pumpkin. After the pumpkin was emptied of its innards, the students placed a few fist-sized rocks into their fire. 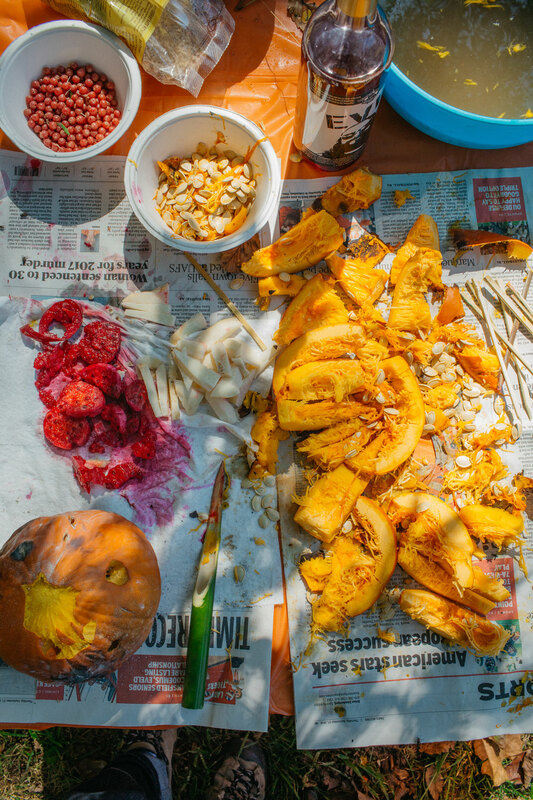 Arranged on a nearby picnic table was an assortment of herbs and vegetables foraged from the forest. 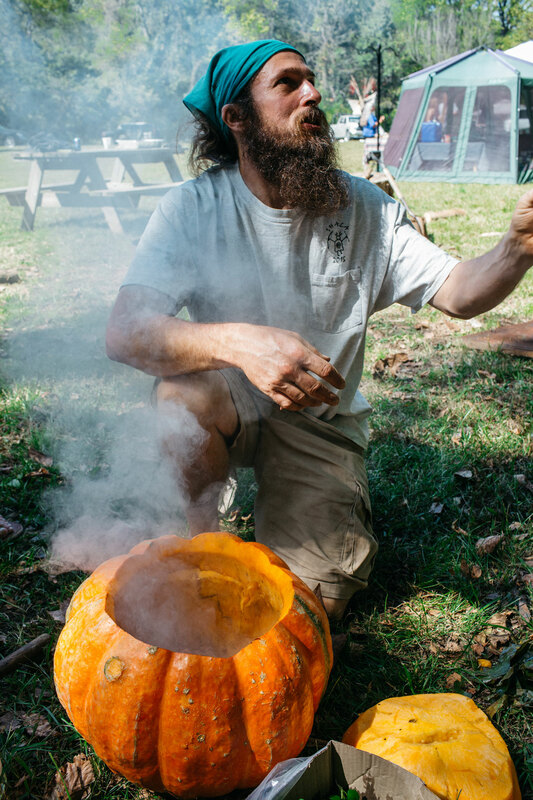 Once the rocks were hot enough, the instructor put the rocks into the pumpkin along with the herbs, vegetables, meat and water. Steam swirled up and covered him, engulfing all of us in a pleasant aroma. It was a delicious lunch. 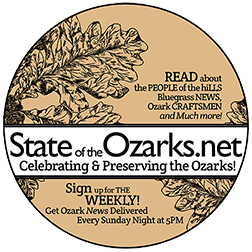 Much like the rest of the Ozarks, the Hulston Mill park is surrounded by thick underbrush and covered with a lush canopy of native hardwood trees. Small creeks flow freely. As I approached the mill, I saw vendors lined along the small roadsides that cross the meadow. It seemed everywhere I stopped, I made a new friend. At one of the tents was a man sitting under a light, knapping an arrow head. As I approached, he offered me cup of coffee. “My name’s Cecil,” he said and I sat down to watch him craft an arrowhead from a piece of obsidian. 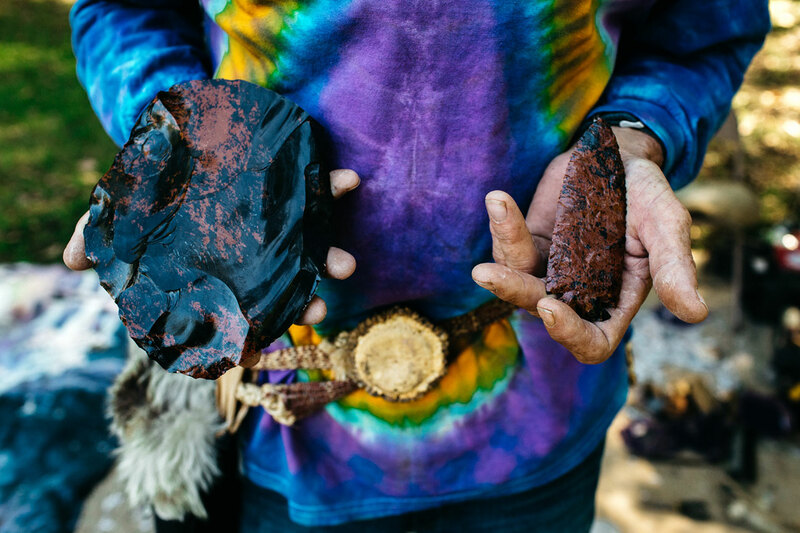 Flintknapping is the process of “forming any conchoidal fracturing rock into a shape.” You can strike or apply pressure to fracture the rock. Eventually this process can yield a number of tools. Perhaps the most noted tool is the arrowhead. Seeing I was interested, Cecil slowly stood up and walked over to a shadow box from which he pulled a number of arrowheads. The first arrowhead in his hand appeared almost all black. “Doesn’t look like much does it?” he asked, before holding it up to the light. 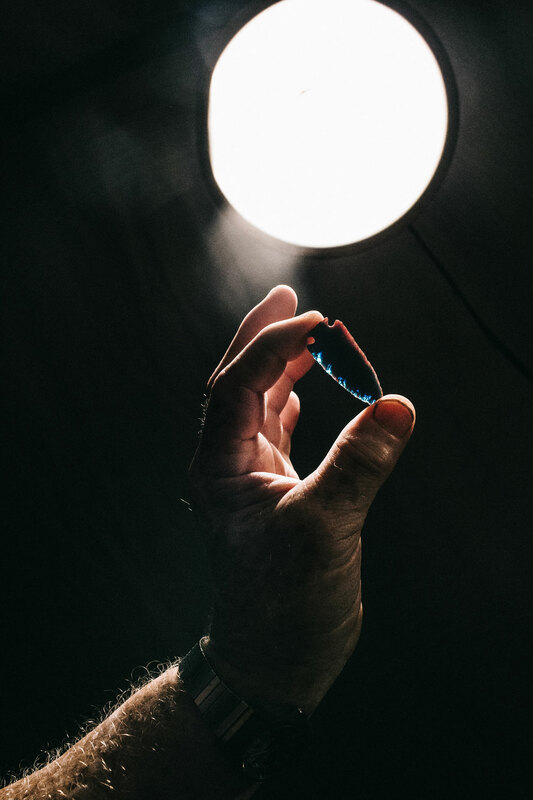 Beneath the bare lightbulb’s glow, the arrowhead’s edges turned a brilliant red and blue. As I was walking away from Cecil’s tent, I saw Regan Bealer, one of my contacts and an experienced outdoorsman. Telling Regan about the arrowheads Cecil had shown me, Regan replied, “He is a man of a dying breed, Josh. His brain is like a library of outdoor knowledge. My mentor was Jim Redfern and Cecil was his.” Regan has a deep connection to almost everyone at this gathering. “I put tobacco poison on a dart and shot a squirrel once. He was dead before he reached the end of the roof. It took about eight seconds to kill him,” said Bo Brown, a lean man with white hair and round glasses. In 1998, Bo co-founded the event with Don Brink. 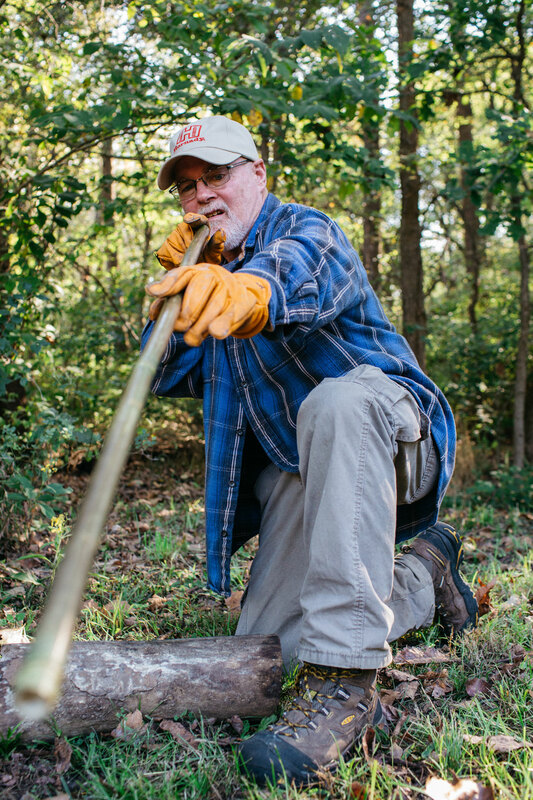 Here at Bois D’Arc, Bo teaches students how to make a river cane blowgun from scratch. A piece of bamboo is heated over a fire and then bent over and over to make the bamboo straight. The next step is to make the inside as smooth as possible. Bamboo is naturally segmented, so you have to clean the inside out using a long rod. The darts are also made of thin slivers of bamboo. To one end of the dart, thistle down is tied on. The plant material will create pressure behind the dart inside the bamboo shaft. To test the blowgun, one of the student loaded a dart and took a big breath, aimed at a tree and blew hard into the bamboo shaft. “Whap!” The dart stuck right into the tree. 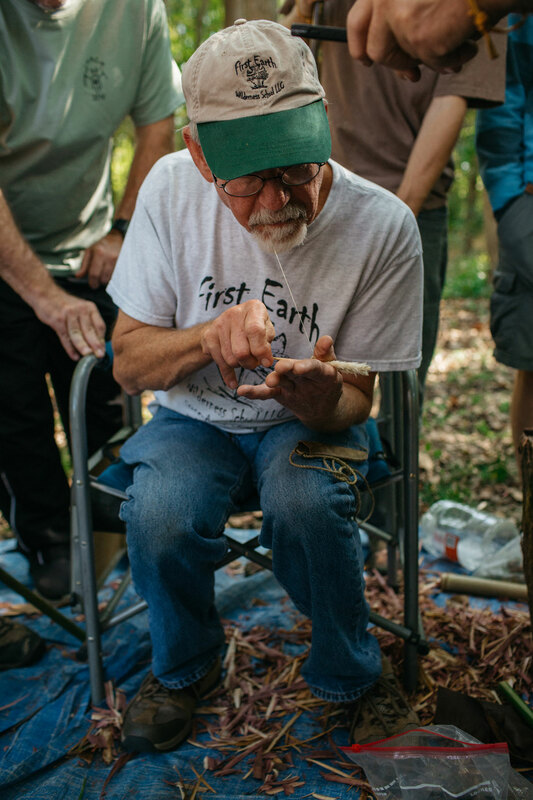 Blowgun making is just one of many classes taught at the encampment. 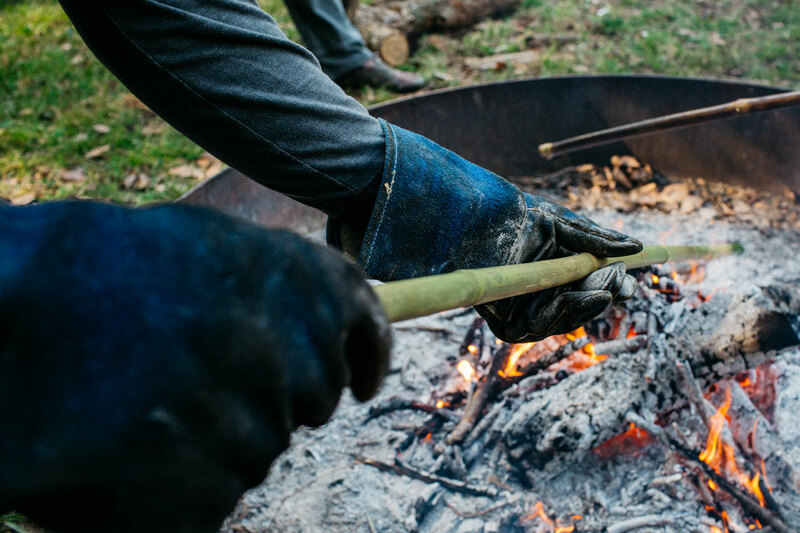 Other classes include friction fire, flute making, bone tools, primitive cooking, shelters, edible insects. The list goes on. 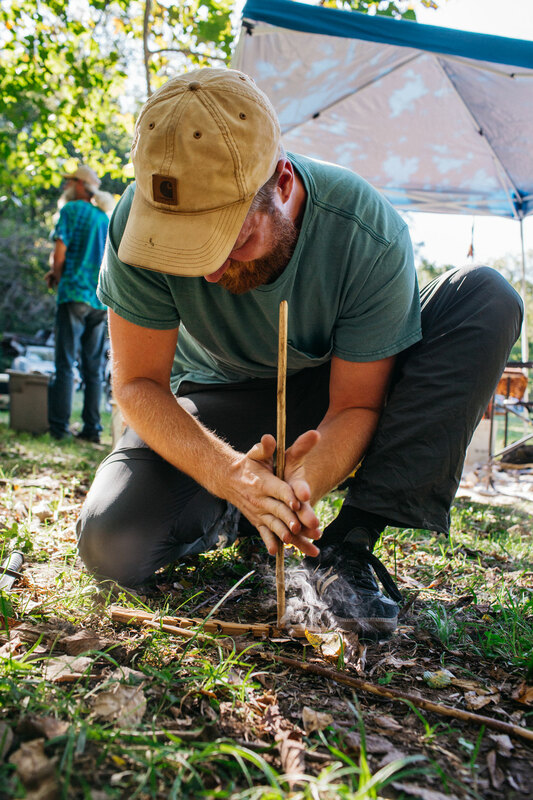 After the blowgun class had finished, one of the young men I had met — Riley Hughes — pulled out a hearth and drill, tools used to create a friction fire. You place the hearth on the ground and put a notch in it. Then you put the drill – a long straight rod – onto the hearth and spin the drill back and forth using your palms. Eventually where the drill meets the hearth, smoke will appear. Now I have some mild experience with starting a hand fire but I have never seen as much smoke as when this man started his fire! Plumes of smoke were floating up from the hearth. After he finished, I looked down in the hole on the hearth and there was a red-hot ember glowing. Many of the times I had put my hand to this task I would look down and there was barely a shimmer in the hearth that would last just a few seconds. Riley’s embers lasted for several minutes. Toward sunset, an old Indian sage picked up a drum and began beating out a rhythm. He asked if there was anyone who had lost someone close to them. “We will lift their spirits up in a traditional Indian song and prayer,” he said. Not too long ago the art of flintknapping was all but lost. 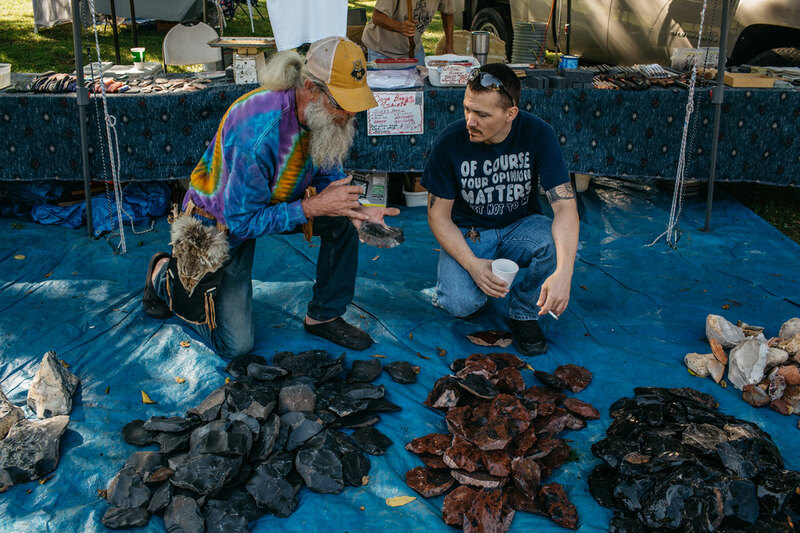 The people of this gathering come together to preserve and pass on not only flintknapping, but a sense of tradition. Regan hopes he can pass his primitive skills on to the next generation, a way of paying respect to his Native American ancestors. The man leading the drum prayer was John Hernandez, who has since passed on and his passing has taken a great toll on the Bois D’Arc community. “He was just a great friend,” remembers Bo. “You couldn’t be around him without laughing.” Hernandez was a storyteller, weaving knowledge and understanding of the past to make sense of a present often disconnected and violent. Next year in late September, this community will gather here again, beneath the setting sun, beneath the canopy of trees. 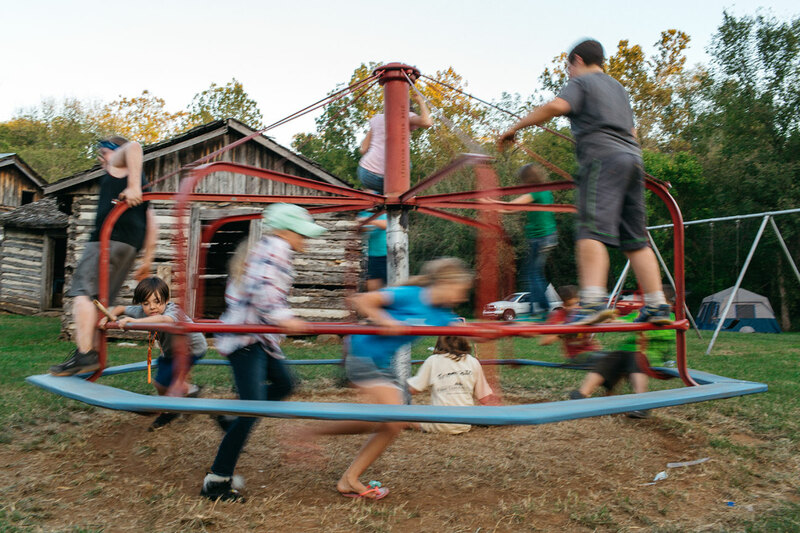 Children will play safely in the woods and the brooks. Stories will again be told. Skills learned. And the care and sacrifices of the past generations will not be lost.